"I live and work in one of the most beautiful places in Bulgaria - my birthplace Trudovets. Here I spent my childhood surrounded by sunny magical landscapes in the soft recesses of the Balkan Mountains and under the strict gaze of Mount Murgash. I remember games on the dusty streets, curiously peering into pebbles ... and what wonder. I would find countless colours and shades. How beautiful and fragrant bunches of field flowers and grasses ... I did use to pick up. Every evening lurking at the bottom of our street I would stay alone, only with myself before the magic of sunset and quietly promising it that tomorrow I would be better. Days passed by, changing seasons, not only annual, but these of life ... Childhood was over and I had to choose my own way. I dreamed to do with biology and chemistry ... But fate destined for something other Gradually my unconscious and somewhat random drawings with charcoal and pencil turned into colorful landscapes, still lives, abstractions. I never acquired classical art education, but exactly this fact has always whipped my quest to learn, to seek, to want more from myself. I arranged my first though modest solo exhibition in Botevgrad. Good reviews and first purchases breathed in me strength and courage to continue to create colours and shapes. 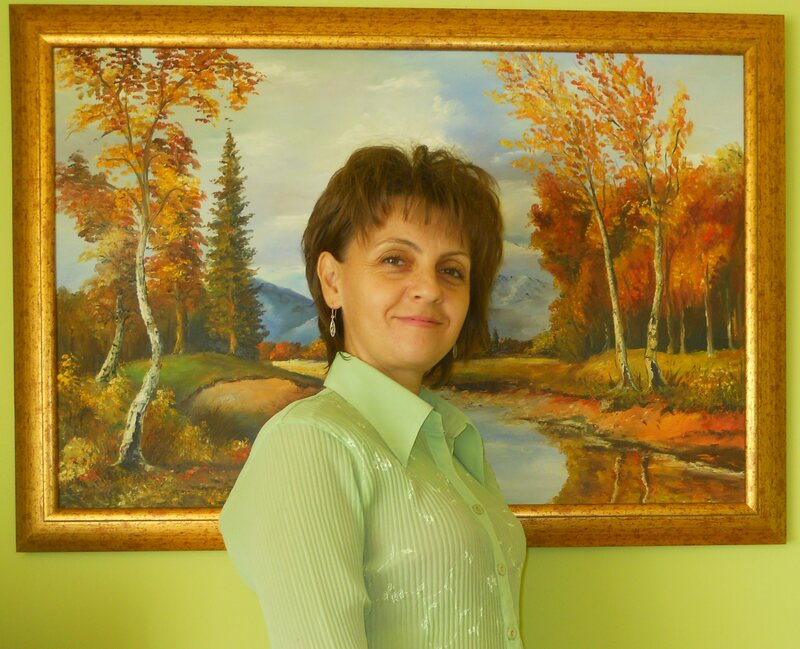 .I started to repaint the works of Shishkin, Aivazovsky, Claude Monet, admiring the artistry of Shtarkelov etc..I got invaluable help from professionals Stanimira Vulcheva and Kalin Petkov. But most of all I listen ed to the appraisal of my three children. Today I work mainly in the field of oil painting. I am excited by different themes and objects .Sometimes I do experiments with small deviations in recycling by creating objects and decorative panels of supposedly already unnecessary materials. I got to know the techniques of quilling and decoupage. Then there is a reason to breathe the air of this earth."